2-Port Swivel Charger (10 Watt Per Port/2.1 Amp Per Port) is rated 1.0 out of 5 by 1. Charge two devices at once, including the latest generation devices, at home or while traveling. The USB 2.0 Ports are universal, so you can still charge your legacy devices. And you never have to share the power -just plug in and power up two devices at the same time. This charger offers fast, convenient charging for smartphones, tablets, and any other device that charges via USB cable. This charger plugs directly into your AC wall socket, so you'll always be within reach of a quick battery boost. You'll be able to charge your devices without having to connect them to a computer or bulky docking port. Rated 1 out of 5 by jogper from Dissatisatified mine crapped out after less than a year, not worth the $40, imho. no longer charging from either port or in any swivel position. 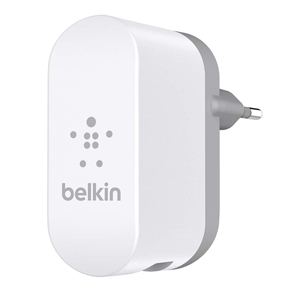 makes me leery of any Belkin product(this was my first and first impression is poor.